It’s not everyday that an EP comes your way after extensive roadtesting by none other than A LOVE FROM OUTERSPACE aka ANDREW WEATHERALL and SEAN JOHNSTON). But an intro email and a gentle nudge from Johnston is indeed how Milan-based BRIOSKI’s new EP wound up on THRONE OF BLOOD. 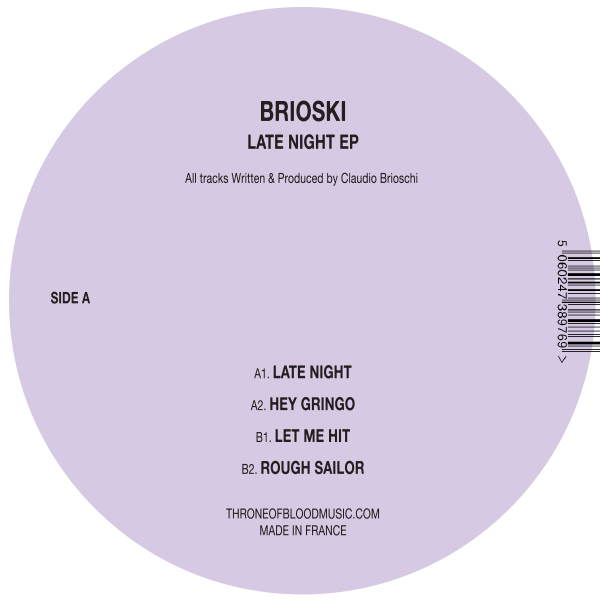 Brioski kicks things off with “Late Night,” pairing drum machine funk with a warped bassline, smokey atmospherics and some italo synths to lighten the proceedings. The vibes persist even as the tempo falls with “Hey Gringo,” a slo-mo groover with heavy bass and some spacey vocal samples. “Let Me Hit” brings things back to the dancefloor, juxtaposing a robotic house loop with one of the biggest basslines we’ve heard in a while. Brioski’s off kilter brand of funk shines, twisting the groove into a leftfield acid breakdown halfway through. “Rough Sailor” closes out the LATE NIGHT EP, pairing still more analog synths with robofunk bass throbs and a finely tuned handclap. Be it a big dark room or a cramped basement jam, jams like these ensure it will be a LATE NIGHT.